When designing lighting fixtures, the material used for each component can greatly affect overall product appearance, performance, and longevity. This is true for industrial, commercial, and residential fixtures alike. Not only does material choice impact product aesthetics, which is particularly important in commercial and residential scenarios, it also affects how your lighting fixture will perform in the challenging or harsh conditions that often occur in industrial applications. Aluminum: As an all-around well-performing metal, aluminum is one of the most commonly used materials for stamped lighting fixtures. Quite ductile and easy to machine, it’s a reliable, easy-to-use option for any stamped product. It’s also lightweight, with a low density but a high strength-to-weight ratio. Stamped aluminum parts can be very strong and there are several aluminum alloys available designed to increase this strength. Cold Rolled Steel: Cold rolled steel is an ideal metal for lighting fixture applications where production precision is critical. More highly processed than standard hot rolled steel, cold rolled steel holds tolerances extremely well. Cold rolled steel also generally has higher tensile and yield strengths than standard steel, and it can accept a wide variety of surface finishes. Stainless Steel: The term “stainless steel” covers a diverse range of steel alloys, the primary distinction being that the blend is a minimum of 11% chromium by mass. The properties of different stainless steel alloys vary greatly depending on the alloying agents that are used, but there are some constants. For instance, all stainless steels have quite high strength and very good corrosion resistance; they also tend to require very little maintenance and have a shiny, silver luster ideal for applications that require clean, modern aesthetics. Copper: Because it is so soft, ductile, and malleable, copper was among the first metals ever used by humans. Today, these properties make it an ideal material for metal stamping. Also, copper has excellent thermal and electrical conductivity, making it well suited for internal lighting components. Its high corrosion resistance and attractive patina make it equally well suited for low-impact aesthetic uses. Brass: Brass is a copper alloy, the primary alloying agent being zinc. Brass retains the malleability and ductility of copper and has the added benefit of increased strength. An attractive and tarnish-resistant material, it is well suited for both commercial and residential lighting applications. Softness, corrosion resistance, surface regularity, and reactivity to a range of chemicals all vary per precise alloy, so it’s important to select alloys carefully, with end use and specific application environment in mind. 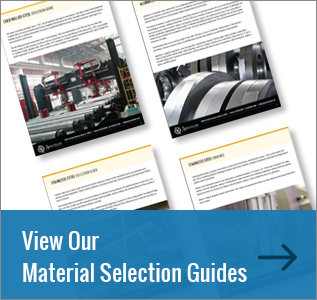 To learn more about the different metals and alloys available for use in metal stamped lighting fixtures and components, download our material selection guides.